"This Amazon Exclusive offer is perfect for your pride this summer. Enjoy a roaring day out, with no booking fees on tickets to Saturday and Sunday matinee performances of The Lion King throughout the whole of July and August. Simply book your no booking fee tickets by 19th July." Tickets available September onwards @ £29.10 which is cheaper than Ticketmaster impressively!! This Amazon Exclusive offer is perfect for your pride this summer. Enjoy a roaring day out, with no booking fees on tickets to Saturday and Sunday matinee performances of The Lion King throughout the whole of July and August. £29.10 seems a great price. I paid double that for tickets to see it in Bradford. This Amazon Exclusive offer is perfect for your pride this summer. Enjoy … This Amazon Exclusive offer is perfect for your pride this summer. Enjoy a roaring day out, with no booking fees on tickets to Saturday and Sunday matinee performances of The Lion King throughout the whole of July and August. The only saving is on the booking fee - the ticket price is the same as you would pay with ticketmaster or direct with theatre, but tickmaster for example charge £3 fee whereas this is £1.60 so it's only actually a £1.40 saving. The other thing is the lower priced tickets (lowest being £27.50) are almost impossible to come by - the reason being they are bought up as soon as they become available by the ticket booths in Leicester square (with the exception of the wonderful TKTS booth) and are then sold on at £50+ to gullible tourists. The only saving is on the booking fee - the ticket price is the same as … The only saving is on the booking fee - the ticket price is the same as you would pay with ticketmaster or direct with theatre, but tickmaster for example charge £3 fee whereas this is £1.60 so it's only actually a £1.40 saving.The other thing is the lower priced tickets (lowest being £27.50) are almost impossible to come by - the reason being they are bought up as soon as they become available by the ticket booths in Leicester square (with the exception of the wonderful TKTS booth) and are then sold on at £50+ to gullible tourists. Yeah looked on Ticketmaster and couldn't find anything cheaper than £40 for a lot of the dates (all sold out) that Amazon have. Yeah looked on Ticketmaster and couldn't find anything cheaper than £40 … Yeah looked on Ticketmaster and couldn't find anything cheaper than £40 for a lot of the dates (all sold out) that Amazon have. That's true - obviously they have bought up all the cheaper seats so it will be the only way to buy them for these dates. 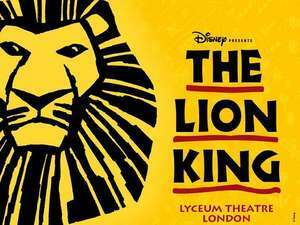 It should be said, Lion King tickets are never discounted much (with the exception of kids week and the getintolondontheatre offer) so this probably does represent the cheapest way to see the show. Have you checked the seat number via this provider and the example you gave via Ticketmaster? as there is a massive difference in price depending on where you're sat/view etc. even in the same grouping e.g. Grand Circle. The £29.10 you mentioned is for a ticket with a face value of only £27.50, so is likely to be a restricted view seat and/or far from the stage. Have you checked the seat number via this provider and the example you … Have you checked the seat number via this provider and the example you gave via Ticketmaster? as there is a massive difference in price depending on where you're sat/view etc. even in the same grouping e.g. Grand Circle.The £29.10 you mentioned is for a ticket with a face value of only £27.50, so is likely to be a restricted view seat and/or far from the stage. So if £29.10 is for a ticket with face value of £27.50 how the heck does that happen if there's no booking fee involved? This sounds anything but a deal to me! So if £29.10 is for a ticket with face value of £27.50 how the heck does t … So if £29.10 is for a ticket with face value of £27.50 how the heck does that happen if there's no booking fee involved? This sounds anything but a deal to me!